A century ago, a UI engineering professor built bridges in Iowa City and on the battlefields of Europe. F.W. Kent Collection of Photographs (RG 30.0001.001), University Archives, the University of Iowa Libraries Left: Maj. Byron James Lambert in January 1918 at a rifle range in Camp Glen Burnie, Maryland. Right: Lambert, a professor of structural engineering, is pictured in 1912. When Byron James Lambert joined the State University of Iowa’s College of Engineering faculty as an assistant instructor in 1902 at age 28, he probably had no idea that his career would later take him to wartime France. Indeed, the need overseas for U.S. military officers and soldiers trained in structural and civil engineering was sudden and unprecedented in 1917. Early that year, the U.S. formally entered the Great War and, at about the same time, established the Student Army Training Corps, the forerunner to today’s Reserve Officers’ Training Corps. SATC programs were established at scores of colleges and universities across the U.S., including the State University of Iowa. 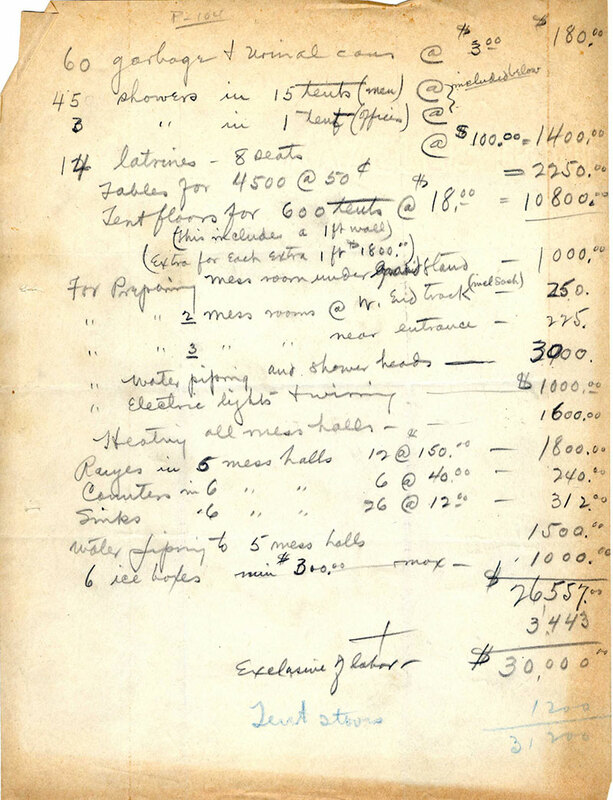 The Byron James Lambert file, Staff and Faculty Vertical File (RG 01.0015.003), University Archives, The University of Iowa Libraries Maj. Lambert's budget notes detailing battalion supply needs, 1918. The new and frightening technologies of war unleashed at that time—bombing attacks by air, tanks, chemical warfare, and flamethrowers, among other weapons—demanded an improved network of roads in western Europe to permit critical transport of personnel and supplies. Lambert, by now a professor of structural engineering and head of the department, understood this and enlisted in the U.S. Army in November 1917. Commissioned as major of engineers, he was assigned to the 23rd Engineer Regiment in charge of the Third Battalion. Correspondence and other documents in Professor Lambert’s biographical file in the University Archives confirm that his 10 months in Europe, from March 1918 until his honorable discharge in January 1919, entailed critical duties as part of the American Expeditionary Force. First stationed at Saint-Nazaire in France, he was in charge of road development and maintenance in Base Section No. 1 in the western part of the country, and soon oversaw railroad and warehouse construction at Montierchaume. He supervised road and bridge work near Verdun, and he was chief bridge engineer during the Battle of Saint-Mihiel. Maj. Lambert returned to Iowa City and civilian life in early 1919, and he served as head of the College of Engineering’s Department of Civil Engineering until his retirement in 1940. He continued to teach until about one year before his death in 1952 at age 78. We can sense Byron James Lambert’s impact on our campus today. Before he entered military service in the summer of 1917, he designed and oversaw construction of the three-arch Iowa Avenue bridge spanning the Iowa River west of Old Capitol. Except for some rehabilitative work in 1985, the bridge remains largely in its original form today. His legacy is also present in France, where citizens today use a road and rail system enhanced by his design and construction skills a century ago. Maj. Lambert's budget notes detailing battalion supply needs, 1918.